Elongated lenses of palustrine limestone interbedded with Mio-Pleistocene fluvial sands were exposed within a sand quarry in the north of Kuwait. Detailed field investigations, thorough petrographic and nanoscopic examinations and geochemical analysis revealed that they were originally precipitated as carbonate microbialite in isolated freshwater ponds scattered within a fluvial floodplain. These lacustrine microbialites were subjected to intermittent drying and wetting conditions and eventually altered to pseudobrecciated nodular palustrine limestone through several pedogenic and early diagenetic processes. The pedogenesis is exhibited by cracking, nodulization, mottling, pseudomicrokarst and root traces. The desiccation macrocracks are filled with siliciclastic sands derived from short-lived flash floods. Diagenesis is represented by aggradational neomorphism of micrite, cementation of cracks and voids by sparry calcite and precipitation of biogenic needle-fibre calcite. Concurrently, the cracks filled with siliciclastic sands have been calcretized, forming an embedded interapalustrine calcrete. Mottling postdates the early diagenesis and is manifested by pseudoclotted texture and abundant black spots and dendrites, which may have been developed by the marmorization of iron and manganese ions due to the seasonal fluctuation of groundwater. The δ13C and δ18O values are mostly comparable with those of closed freshwater lakes; however, the high negative values of δ18O may be attributed to diagenetic calcite. The occurrence of this palustrine limestone within a fluvial siliciclastic sequence that lacks clearly developed calcrete profiles may present an exceptional setting for palustrine limestone. The online version of this article ( https://doi.org/10.1007/s12517-019-4309-0) contains supplementary material, which is available to authorized users. 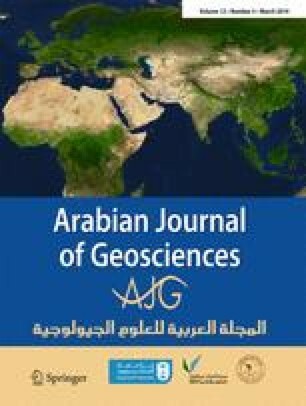 This research was supported by the Earth and Environmental Sciences Department, Faculty of Science, Kuwait University. The XRD analysis was provided by the Research Facility Unit (GS01/01) of the Faculty of Science. The SEM examination and EDS analysis were performed in the Kuwait University Nanoscopy and Nanotechnology facilities (GE01/07). Mr. M. Rajab and Mrs. Lidia are acknowledged for their support in SEM/EDS analysis. The isotope analysis was carried out by the Environmental Isotope Laboratory of the University of Arizona. The authors are grateful to Mrs. N. Saied and Mr. N. Basilli for their devoted assistance in the field and laboratory work and to Mr. M. Saber for performing the XRF analysis. Mr. Y. Abdullah and Mr. H. Mahmoud are also acknowledged for their help in the preparation of thin sections and sample grinding. We are thankful to the anonymous reviewers for their comments, which improved our presentation significantly.